Carol A. (Lynch) Stevens, 81, of West Bridgewater, passed away on Monday, November 19, 2018 at the St. Joseph Manor in Brockton after a three-year battle with cancer. She was the wife of the late Arthur Stevens. Born August 20, 1937 she was a daughter of the late George F. Lynch and Dorothy (Langley) Lynch. Carol was a graduate of Brockton High School. After high school she attended Chandler Secretarial School in Boston. She worked for Foot Joy and for Dr. Baler’s Dermatology office in Brockton. Carol adored her family and felt great pride in her grandchildren, sharing pictures and stories with those around her. She held an equal love for her friends and cherished every moment she spent with them. She loved to travel with them and attend events and classes at the East Bridgewater YMCA. Her favorite game was Canasta and rarely let anything interrupt her weekly game. She is survived by her loving children, Dorothy L. Saunders and John P. Berglund and his wife Kimberley; her 4 grandchildren, Carol, John, Justin and Nicole; her 3 great-grandchildren and several nieces and nephews. She is also survived by her dear friend Patricia Goss. She was also the step-mother of Barbara Lawson and her husband Robert, Kathleen Stevens, Judith Petrone and her husband Donald, Diane Laforte and the late Holly Stevens. 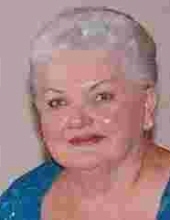 She was the sister of the late George, Gerald and Kevin Lynch. Funeral from the Russell & Pica Funeral Home, 441 South Main St., (RT 28) West Bridgewater, on Tuesday, November 27th at 9:30AM thence to St. Ann Church, 103 North Main St., West Bridgewater where a funeral mass will be celebrated for the repose of her soul at 10:30AM. Interment will follow in the Pine Hill Cemetery, West Bridgewater. Calling hours will be held in the funeral home on Monday from 4:00PM-8:00PM. . In lieu of flowers donations may be made in Carol’s memory to the National Ovarian Cancer Coalition. https://events.ovarian.org/nocc/Donate. "Email Address" would like to share the life celebration of Carol A. Stevens. Click on the "link" to go to share a favorite memory or leave a condolence message for the family.